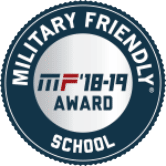 Grace Christian University is proud of the courageous men and women who serve our country, and we delight in being a military friendly university. We offer military tuition assistance, help processing your GI Bill college benefits and other applicable military scholarships and benefits. We also offer college credit for qualified military training and/or experience. We are here to help you with your military scholarships and veteran benefits, so that you can focus on your academic goals. As a military friendly school, Grace Christian University offers a military tuition discount of $250 per credit hour on all Associate, Bachelor, and Master courses. This discount is offered to all military service members, veterans, military spouses, and dependents 23 or under (Honorable Discharge required). This is in an effort to match the GI Bill® college benefit of $250 per credit hour and potentially allow military students to attend Grace Christian University with no out of pocket cost. The military tuition assistance is offered at any time throughout the year to all qualified individuals and applies to all classes taken online. Individuals receiving the military discount are required to cover the Resource Fee associated with each course. To access your Post 9/11 GI Benefits you will need to set up a VONAPP account. The application forms in VONAPP are now available on www.vets.gov and on www.ebenefits.va.gov. If you already have a VONAPP account please log on to apply for your benefits. Our specially-trained staff is completely devoted to military and veteran students and the processing of their military scholarships and other financial benefits. If you have any questions regarding these benefits, feel free to contact our School Certifying Official and Veteran Benefits Coordinator Kurt Postma at 616.261.8557 or email at kpostma@gracechristian.edu. Grace Christian University also offers a free evaluation of military training and experience for college credit when you submit your Joint Services or American Council on Education (ACE) Transcript. Grace Christian University, a Military Friendly University proud to serve YOU!